I am slowly starting to like tempeh, after being traumatized from a bad tempeh cooking experience last year. I think its more the texture that I have to get used to than the taste. I really like it crumbled but having it as one slice is something I am still getting used to. 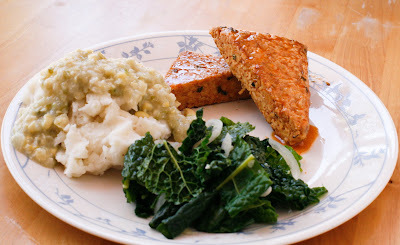 The marinade for this tempeh can be really spicy or mild, depending on the hot sauce you use. I used Cholula's Chili Garlic hot sauce and it wasn't that hot. The gravy was also a little on the spicy side because of the jalapenos, so if you are not a fan of spice, this dish is not for you. But like I said, the heat is controllable depending on what type of sauce and how many jalapenos you add. If you would like, you could even leave the jalapenos out all together..a corn gravy would be just as good! 1. Bring a medium-size pot of water to a boil. Whisk all the marinade ingredients together in a bowl large enough to fit the tempeh slices. 2. Cut the tempeh in half, width wise, then cut each of the resulting squares diagonally, to form four triangles. When the water is boiling, lower the heat to a simmer, and cook the tempeh triangles for 10 minutes. This steams the tempeh and removes and bitterness, plus readies the tempeh to absorb the marinade. 3. Use tongs to immediately place the tempeh in the marinade bowl. Let marinade for 1 hour, flipping the tempeh every now and again to cover with the marinade. Preheat a greased cast-iron grill pan over medium-high heat. To grease it, brush lightly with olive oil or, if you have a spray bottle of olive oil, that works, too. Grill each side of the tempeh for 5 minutes. When the second side is almost done, spoon some of the marinade over the tempeh and let it cook for 30 more seconds. Preheat a heavy-bottom pan over medium heat. Add about 1 Tb of oil to the pan. Cook the tempeh for about 10 minutes, turning often and spooning a bit more marinade over the tempeh as you turn it. Preheat the oven to broil. Place the tempeh in an oven-safe pan ( such as cast-iron ) or a rimmed baking pan. Spoon some of the marinade over the tempeh and broil for 5 minutes. Flip it and spoon some more marinade over it, and cook for another 5 minutes. When the second side is almost done, spoon some of the marinade over the tempeh and let cook for 30 more seconds. 1. Preheat a sauce pan over medium-high heat. In a measuring cup, mix the cornstarch with the vegetable broth and set aside. 2. Saute the onion and jalapenos in the oil for about 5 minutes, until the onions are translucent. Add the garlic and sage, and saute for 1 more minute. 3. Add the corn and cook for 5 minutes, until the corn is slightly browned. 4. Add the vegetable broth, soy milk, and salt. Stir often and let thicken for 3 to 4 minutes. Remove from the heat and let cool a bit, just so that it's not steaming very much. Transfer to a blender or food processor and puree. Add the lemon juice to taste and puree again, then taste for salt. Gently heat before serving if not serving immediately. Like you I'm not a fan of tempeh really, its really to do with the 'bally' texture. I've had it on my plate a couple of times as part of a Vegetarian/Vegan breakfast and ate it with reservation, my husband did not touch his at all. So what possessed me to buy a jar of it when I was in Nairn quite recently. Not sure. But looking at your recipe right now, I do love heat, so am thinking about giving this recipe of yours a whirl. See if I change my mind on tempeh - if nothing else, it will put a dent in the tempeh jar! Thank you for sharing. Toshiko - I love kale too! Nikki - haha thank you! I love your blog too! I see you have a kitty too? Very cute! Hey Jacklyn, I'm weird about tempeh too. Sometimes I like it just fine, and other times I feel kind of weird about it. I know it has good cultures in it the way yogurt does, so I try to eat it weekly. This looks delicious even if it is tempeh (smile). And the corn gravy sounds awesome...! Thank you Stella. I don't think I know of any fans of tempeh either haha but yes, you're right, its very healthy. Exactly why I want to incorporate it more into my meals.